Automatic tablet printing machine can print characters on any tablets in any size and shape like round, ovals, triangular, hexagonal tablets. 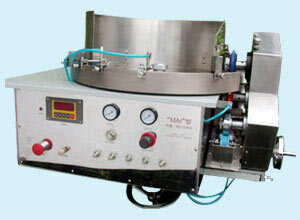 Feed disc & gravure rollers are available in any size in order to obtain most efficient production. It is compact in structure and easy to operate. Scrapping of excess ink on the printing roller is done on the pneumatic pressure or manually.